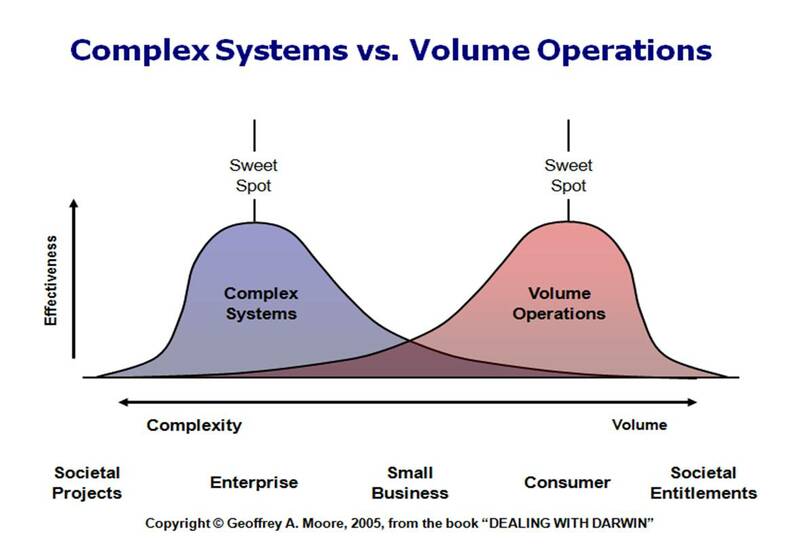 In his book Dealing with Darwin, Geoffrey Moore - the one of the Crossing the Chasm fame - has explained the difference between the complex systems and volume operations. According to this concept, technology vendors fall into one of two categories. The complex systems vendors focus on a relatively small number of high-value, high-touch transactions that are delivered in the form of sophisticated, customized solutions, usually integrated with other systems. The volume operators are doing exactly the opposite. They deliver relatively simple, inexpensive solutions through low-touch transactions - no direct sales force but resellers, retailers or online sales. These solutions come with no customization, no integration with other systems, and a limited feature set - one size fits all. While there are many scenarios in between (i.e. 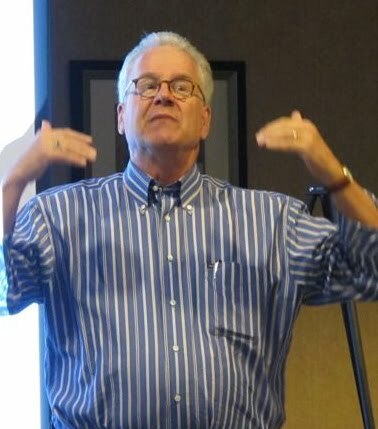 small business offerings), Geoffrey Moore suggests the the more a vendor is focused on one or the other extreme, the more effective the business model. 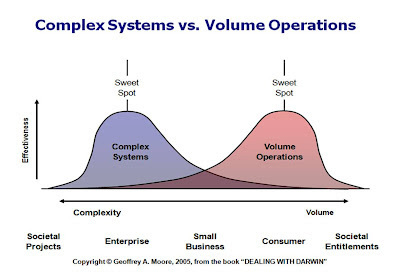 IBM and Oracle are examples of complex system vendors while Apple and Google are volume operators. The most important point that Moore makes is that vendor business models become so optimized for one or the other business architecture that crossing from one side to the other is impossible. Having started on one side of the model, the vendor’s business model, business processes, and key performance metrics are completely hard-wired towards the particular model that makes switching practically impossible. Now, let’s mesh the Moore model with another one - the Innovator’s Dilemma by Clayton Christensen. 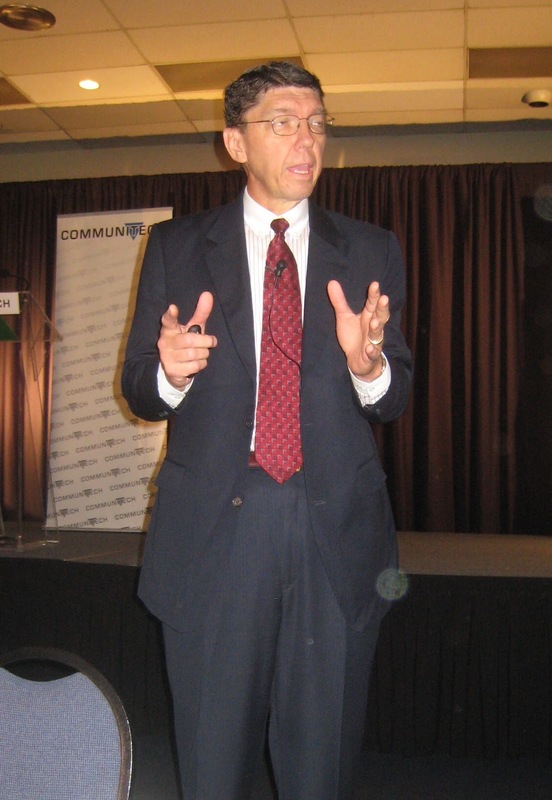 Professor Christensen suggests that disruptive innovations will always be attacking the incumbents from the bottom up - by providing low-end solutions for the less demanding customers and thus flying under the radar of the incumbent market leaders - until they gain the critical mass and sufficient functionality to challenge the incumbents. OK, time to put the two models to work - in enterprise software. The established vendors including IBM, Microsoft, and Oracle are supposedly being challenged by the disruptors coming from the lower end of capabilities - just like the Innovator’s Dilemma predicted. Those disruptors are companies such as Salesforce, Google, Dropbox and others. They all have one thing in common - they are cloud based. But how do they do it when we look through the Geoffrey Moore lense? Salesforce is a cloud based disruptor that has initially targeted the sales force automation (SFA) market and later the customer relationship management (CRM) market with a cloud based solution. Salesforce has clearly started as a complex system from day one and they have continued evolving in that direction. Their initial customer base were mostly smaller companies and departments but they continued focusing on complex systems - evolving towards more valuable and more complex deployments. Salesforce never had to shift from one side to another on the Geoffrey Moore model. Today, a typical Salesforce deployment involves integration to marketing automation and enterprise resource planning systems. Microsoft started as a complex systems vendor with enterprise on-premise offerings such as Exchange and SharePoint (note: I’m discussing the enterprise software here, not their Xbox business). To take on the cloud challenge seriously, Microsoft created Office 365 - a cloud based offering that is clearly going in the direction of volume operations on the Moore model. That actually explains why Microsoft uses different branding for the cloud based solution and why they are not particularly worried about the integration between Office 365 and the on-premise offerings. While Microsoft shouldn’t be able to switch from the complex systems model to a volume operations model, they are applying their considerable financial resources to power through those challenges, ignoring the business model altogether. Google and Dropbox started as cloud-based offerings focused purely on volume operations - on the consumers. The consumer focus and free price helped them to grow their user base quickly, often infiltrating the enterprise. But the offerings have been clearly designed as consumer software aiming to attract as many eyeballs as possible at the least possible cost. That means basic feature set, no customizations, no integrations, no direct sales force - simply one size fits all service. While vendors such as Google, Dropbox - and also Apple, Amazon, Evernote, etc. - have a good formula to drive user adoption and even penetrate the enterprise, their business model has been designed to cater to the consumer and not to the enterprise. Enterprises need, I repeat “need” customization and integration with other systems. Just think of managing user lists and groups. Sharing content on Dropbox with your friends might be easy, sharing something with all the employees in Sales or Marketing in your company is much less trivial. You can’t manage all the user groups by hand and thus you need to integrate with other existing systems - i.e. directory services and HR Management system. Enterprise software can do that. Consumer software can’t. The consumer vendors might be penetrating the enterprise but today, they don’t have any enterprise offerings. PS: This post has been inspired by a spirited discussion during the last AIIM Board meeting. I love these conversations with my fellow Board members! Lubor, great post but remember you are part of the incumbent group. I think the real risk is the people like Box, Huddle, and such. They are operating on a difference model and they aren't targeting the consumer. Box may have honed their core tech in the consumer market but the enterprise has been a focus for a while. I think Box is approaching the Medium quality use line. They are building those integrations and exposing an API. The real challenge is the cloud. It isn't just a new delivery model, it is a new financial model as well. I wrote a post on this topic a while back. I've seen very little to change the thoughts behind it. Thanks for the comment, Pie! From what you are saying (and I agree with it), Box is really building a complex system, while starting from the bottom per the Innovator's Dilemma. That's similar to what Salesforce has done and ultimately, Box would end up in the same category. What I observe is true "complex systems" in the cloud are largely being delivered in customized private cloud implementations, some very similar to traditional outsourced environments. Less complex/repeatable patterns like email/calendaring and document sharing will be the first to be accepted in enterprise environments. Traditional complex ECM systems like customized claims/underwriting, benefits enrollment, loan processing are in my opinion far less likely to be provided in multi-tenant cloud environments like box, huddle, etc. especially if they need to meet the unique needs of large businesses. I believe that's the key point Lubor is making. Thanks for commenting, Ken. You got it exactly right.